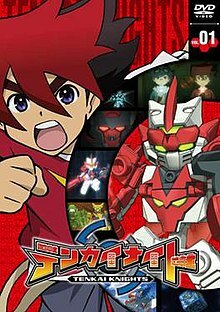 Tenkai Knights (Japanese: テンカイナイト, Hepburn: Tenkai Naito) is a 2013 Canadian-Japanese anime series, produced by Shogakukan-Shueisha Productions and Spin Master and animated by Bones and Shogakukan Music & Digital Entertainment. It officially aired in Cartoon Network in the United States on August 24, 2013 and in Canada on Teletoon on September 28, 2013. After a year, the series premiered in TV Tokyo and its Japanese affiliates on April 5, 2014. Cover for the show's first rental DVD volume featuring Guren Ōgami and Bravenwolf. Tenkai Knights is released to promote Spin Master's line of Ionix brand of construction bricks. Eons ago, a cube–like peaceful planet named Quarton, populated by shape–shifting living bricks called Tenkai, was ravaged by a war between two opposite factions: the Corekai Soldiers, led by the valiant and fearless Commander Beagle ("Beag"); and the Corrupted Army, led by the ruthless Lord Vilius, who desired to obtain the source of Tenkai energy for his own purposes. However, the only ones who were strong enough to defeat him were the 4 Legendary Tenkai Knights of Quarton: Bravenwolf, Tributon, Valorn and Lydendor. Facing defeat, Vilius unleashed the mighty Tenkai Dragon, who was later defeated by the 4 Knights, its fragments scattered across the planet. These heroes were never seen again, but now, a year later, Lord Vilius and the infamous Corrupted Army have returned, more powerful than ever before. Now, on planet Earth, in the year 2034, within Benham City, four young teenage boys Guren, Ceylan, Toxsa, and Chooki find an interdimensional portal to Quarton where they are chosen by Boreas of the Guardians to become the new generation of Tenkai Knights and prevent Lord Vilius and his Corrupted Army empire from taking control of both worlds. The series is first aired in the United States on the cable TV channel Cartoon Network on August 24, 2013, at 7:30 am, and in Canada on Teletoon on September 28, 2013. The English dub is produced by Studiopolis. To coincide with the launch of the property, Spin Master and Kickstart Entertainment produced a 10-episode prequel web-series entitled Tenkai Knights Origins. The series features music by John Majkut and was released onto YouTube as well as the brand's official website between September and December 2013. They also aired as interstitals on Cartoon Network and Teletoon. In Japan, the television series was delayed until April, where it would be aired on the TV Tokyo Network, with the start of its broadcast on April 5, 2014, running at 9:00 am. It would then replace Shogakukan's Oha Coliseum block and Robocar Poli that currently air in the half-hour slot. Several of the affiliates would have the show delayed and begin broadcast on April 12, 2014, airing at 7:00 am. BS-Japan would further delay its broadcast until April 15, 2014, and begin broadcasting at 5:30 pm. A second season of the series was announced to be in development but was cancelled prior to entering production. The Tenkai Knights toy line is produced by Spin Master under the Ionix brand of construction bricks, along with a new Pokémon line. Spin Master refers to Ionix as the next generation of construction, with "Bricks that shapeshift." Their line of products include bricks that look very similar to traditional construction bricks, but actually shapeshift and unfold into unique mini-figures. Spin Master distributes the toys in the United States and Canada while Happinet handles the distribution rights of the toys in Japan. A manga adaptation of the anime series by Ryo Takamisaki was serialized in CoroCoro Ichiban! beginning with its June 2014 issue, published April 21, 2014. The manga concluded shortly after and was later compiled into two tankōbon by Shogakukan, the last of which, released on March 27, 2015, featured an additional 20 pages of material. The series was not released in English. Penguin Random House published four novelizations written by Brandon T. Snider, as well as two choose your own adventure books by Ray Santos in 2014 and 2015. iStoryTime released an interactive book on iOS in January 2014. Phase 4 Films distributed a single home video release of the series in Canada and the United States, titled Tenkai Knights: Rise of the Knights. It presents the first several episodes of the show edited together into a movie and was released on DVD as well as digital platforms on February 4, 2014. A manufacture on demand Blu-Ray version followed on May 4, 2016. In Japan, Happinet and Victor Entertainment released the entire series over four DVD box sets between August 2, 2014, and May 2, 2015. The first 18 episodes were also released through six DVDs for the rental market. Four pieces of theme music are used for the episodes: one opening theme and three closing themes. The opening theme is "Get the Glory" by Ayako Nakanomori. The first ending theme is "Shunkan Diamond" (瞬間Diamond, Shunkan Diamond, lit. "Diamond Moment") by Rurika Yokoyama, while the second ending is "Shōri no Hanataba o -gonna gonna be hot!-" (勝利の花束を-gonna gonna be hot!-, lit. "Victory Bouquet -gonna gonna be hot!-") by Cyntia. The third ending, "Densetsu no FLARE" (伝説のFLARE -, lit. "Legendary Flare"), is sung by Pile. For the English version, John Majkut composed its opening theme with an instrumental version of the same track used for the credits. The series' background score is composed by Majkut and MONACA of Star Driver fame. Happinet released an 82-song soundtrack on CD on March 25, 2015, in Japan. On January 30, 2014, Namco Bandai Games announced a video game entitled Tenkai Knights: Brave Battle (テンカイナイト ブレイブバトル, Tenkai Naito Bureibu Batoru) for Nintendo 3DS, released in Japan on September 25, 2014, and in North America on October 7, 2014. On February 27, 2014, Spin Master and Game Pill launched the free-to-play Tenkai Knights: Battle for Quarton game for iOS devices. The game was also available through web browsers via the Unity plug-in. Other browser titles include Bravenwolf's Run, Race to Redemption and Tenkai Boost. ^ Komatsu, Mikikazu (February 20, 2014). "Crunchyroll - Bones' Kids Anime "Tenkai Knights" to Start Airing in Japan on April 5". Crunchyroll. Retrieved March 24, 2015. ^ "制作はボンズ 「テンカイナイト」4月5日テレビ東京他放送開始、世界展開のキッズアニメ". アニメ！アニメ！. Retrieved March 24, 2015. ^ Loveridge, Lynzee (August 14, 2013). "Tenkai Knights' English-Dubbed Trailer Streamed". Anime News Network. Retrieved September 10, 2018. ^ Loveridge, Lynzee (September 26, 2013). "Tenkai Knights to Debut on Canada's Teletoon on Saturday". Anime News Network. Retrieved September 10, 2018. ^ Majkut, John. "News". Retrieved September 10, 2018. ^ @TenkaiKnights (July 3, 2014). "Second season is in development! More episodes still to come for Season 1!" (Tweet). Retrieved September 10, 2018 – via Twitter. ^ "We hope you all enjoyed the season finale of Tenkai Knights! Plans for season 2 will be announced next year. Stay tuned!". Spin Master. December 8, 2014. Retrieved September 10, 2018. ^ "本｜テンカイナイト オフィシャルサイト". Retrieved September 10, 2018. ^ "Tenkai Knights - Rise of the Knights [Blu-Ray]". Amazon. Retrieved September 10, 2018. ^ "アニメ「テンカイナイト」の音楽・DVD情報". Retrieved September 10, 2018. ^ "Tenkai Knights: Brave Battle announced for 3DS". Nintendo Everything. Retrieved March 24, 2015. ^ "Spin Master launches Tenkai Knights gaming app for iOS". Toy World. February 28, 2014. Retrieved September 10, 2018.